The mighty Titanic - a ship nearly identical to the one described in Robertson's book, down to the smallest details, even the name - met its tragic fate in almost exactly the same way and on the VERY SAME DATE that Robertson's ship did in the pages of his novel... which he conceived of more than a decade earlier. I can order now RISK-FREE at a special, discounted price. YES, I want to see my future, better understand my past, decode my dreams and more. I want an all-access pass to the amazing "Book of Life" so I can live the life I am truly meant to live! 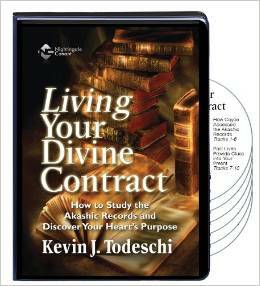 Please send me Kevin J. Todeschi's 6-CD program Living Your Divine Contract: How to Study the Akashic Records and Discover Your Heart's Purpose, plus the BONUS CD for the discounted price of $59.95, which is $80 off the regular price. Take advantage of this limited-time special discount now. If I do not discover life-changing new information about myself after trying this program within 30 days, I will simply send it back for a full refund. No questions asked.